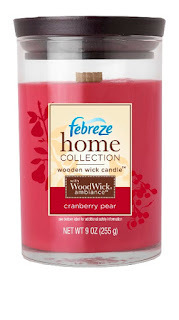 I was recently contacted by MyBlogSpark to see if I wanted to try out and review the new Febreze Wooden Wick Candles. - Love the simple elegant design and wonderful colors of the candles. They are so pretty I don't mind just setting them on the center of my dining room table. - Love the scents (some may be a little strong.) My favorite was the Anjou Pear Spice, so perfect for fall! - 9 "flavors" to choose from: Green Tea Citrus, Pomegranate Mango, Cranberry Pear, Orange Honeycomb, Rosewood Plum and Willow Blossom; as well as seasonal scents that include Anjou Pear Spice, Gingersnap Vanilla, and Yumberry Sangria. - Supposedly, the point of the wooden wick is to "bring the ambiance and sound of a crackling fire indoors." Well, it does that but on a very small scale. If you happen to be in the same room as a small child you will not hear the "crackling fire." If you happen to have it lit in a quiet room you will hear a faint crackle. I love the candles despite this and would still buy them anyway. Green tea citrus sounds intriguing. And I love the color. I've never been the first to comment. One could be the randomly chosen number. I hope, I hope. That pear one sounds delicious! Or the orange honeycomb... To be honest, if I won the gift card, I'd send it to my sister, since I don't have a Walmart near me (that's probably a good thing!). Thanks for the chance! I am thinking the orange honeycomb or the yumberry sangria would be my choice. The crackle sounds interesting... perhaps a bubble bath in silence would let you hear the sounds? LOL Thanks for the chance and have a Merry Christmas! Hmm.. I do like the sound of Pomegranate Mango. However, I would have to sniff the jars to really decide. Do great in the half marathon. I am rooting for you! mmmm gingersnap vanilla I think! sounds so yummy. They all sound delish!! :) I would love to try the Green Tea Citrus! Thanks so much for the chance to win. Hope, hoping!! OOh,I would love to try the Orange honeycomb! They look smely wonderful to me! Thanks for the chance and good luck in that marathon! I hope you kick major booty! It would depend on in which room I wanted the candle to live... green tea citrus sounds like it might clear the air in the kitchen after stir-fry... or at least it would try. I wonder, would you hear the "crackle" over two dogs? Would They hear it and then try to eat it? Or is that just my dogs who taste first, assess danger later? Good luck running your half-marathon! The anjou pear spice sounds interesting for the kitchen. Orange Honeycomb for sure, i just hope it actually smells like honey. with 80 hours, i'd finish a few of my many begun-but-languishing for lack of time knitting projects. I LOVE starting new projects, but they stack up quickly! The cranberry pear sounds good to me. I love candles, but would have to smell before I could chose one. If I had 80 hours of ahhhhh time I could get a lot of Christmas quilting done. Hope you did well in your half marathon! Green Tea Citrus sounds good. It is so hard to choose though! Thank you for the chance to try something new. Good luck with your marathon! orange honeycomb would be my choice. I would love to try the Pomegranate Mango. Orange honeycomb!!! Thanks for the chance to win! The gingersnap vanilla sounds yummy! Thanks for the opportunity. I would LOVE to get the apple/cinnamon one for the holidays!!! Then I wouldn't have to make so much pie??? NOT!!! I would love to try the Green Tea Citrus. If I had 80 hours of ahhh I would take all of my quilting books I got this year and read them. You know the Gingersnap Vanilla sounds pretty good. I'd just love to have a candle that burns for 80 hours! My don't they all sound delish?! How about the Orange Honeycomb or the Green Tea Citrus. Just light and refreshing! I think I would choose Anjou Pear Spice.